The ND Logo is on the top of the bracelet. 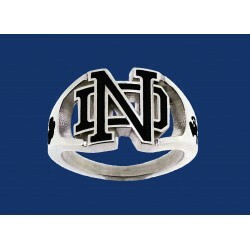 "Fighting Irish of Notre Dame" is etched on the inside of the bracelet. The plate with the wording is 12mm wide and 30mm in length for the ladies' bracelet and 18mm wide and 45mm in length for the men's bracelet.